Above: Cheska Hull, Millie Mackintosh, Pandemonia, Vanessa Feltz, Lydia Bright, Gemma Collins, Lizzie Cundy, Sarah Jayne Dunn, Denise Welch, Meg Mathews, Nick Ede, Sarah Barrand, Tara Palmer-Tomkinson, Nancy Brown and James Argent. What: A Night With Nick in association with The Stroke Association. Where: Swarovoski Crystallized Lounge, London. 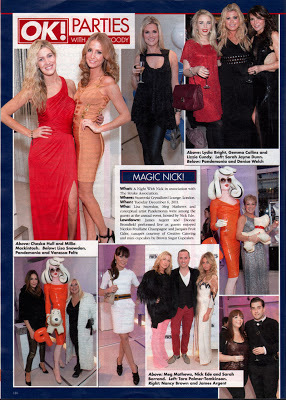 When: Lisa Snowdon, Meg Mathews and conceptial artist Pandemonia were among the guests at the annual event, hosted by Nick Ede. Lowdown: James Argent and Dionne Bromfield preformed live as guests enjoyed Nicolas Feuillate Champagne and Jacques Fruit Cider, canapés courtesy of Creative Catering and mini cupcakes by Brown Sugar Cupcakes.